So hands up, I know this isn’t the post I’m being nagged for; believe me I am desperate to tell all about my adventures around Palestine, but with 1200 photos to edit and pages of journal notes to go through, it’s taken a little longer than I anticipated, so please bear with me! 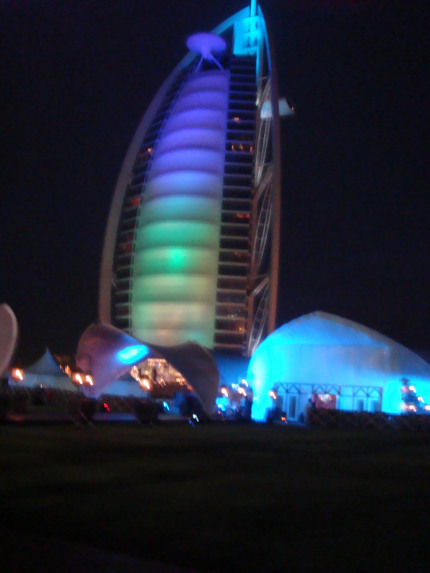 This has to be the best (possibly the only authentic) cultural experience I have ever had in seven years in the UAE. 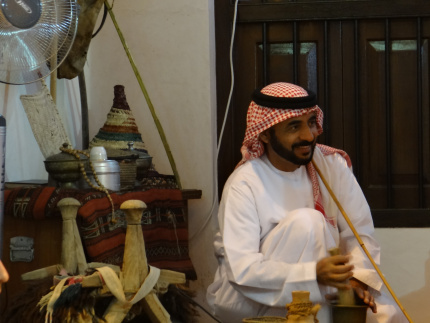 The Emirati volunteers at the centre personified Arabian hospitality and the centre’s ethos of ‘Open Heart, Open Minds’ enabled a rare and privileged insight into the minds and lives of the people whose country we currently call home. 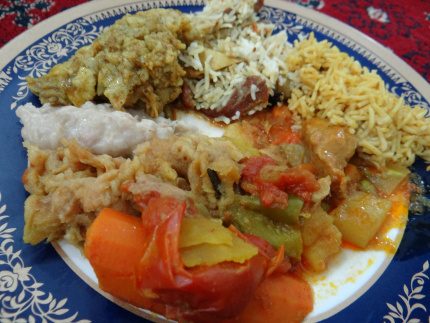 The home-cooked food was fantastic, as was the mindblowingly open and honest conversation (on a variety of subjects ranging from Emirati land/housing rights and jobs, to dating and relationships). 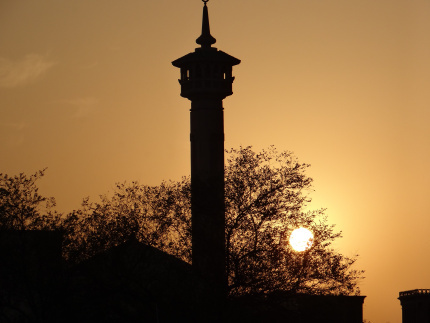 This was followed by a trip to Bastakiya mosque for the call to prayer and a fantastic talk about Islam which was made incredibly accessible through the contemporary analogies used. 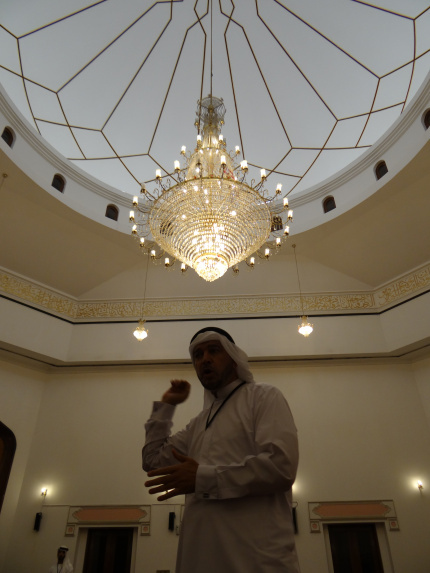 The volunteers then gave us a guided tour back through Bastakiya to the centre for tea and dessert, talking us through the restored buildings’ architecture. On making our way to the car, we passed the very local Majlis Al Areesh and were invited to join the men for zataar tea, shisha, coffee and sweets, in exchange for conversation, smiles and an autograph in their overflowing guest book! 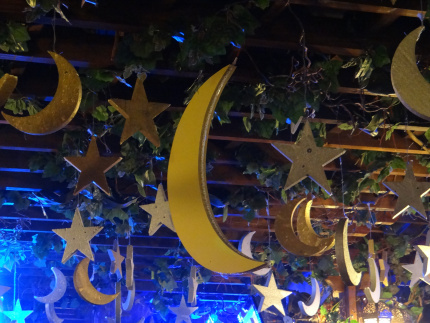 We never made it to the creek and souks after we eventually left them, but it was a fantastic experience and a night to remember. 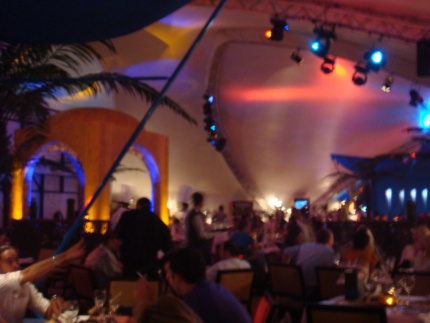 Jumeirah Beach Hotel‘s iftar tent is a long-standing favourite of mine. And no, this is not simply a case of loyalty to a previous employer; after trying the a fair number of Ramadan tents in Dubai over the years, Al Diwan is the only one that has consistently managed to maintain a high standard of food in an exotically elaborate yet intimate environment (although the service left a little to be desired on this year’s visit). The buffet is well stocked with all the usual tempting Arabian suspects, and the dessert table bears a delicious um ali. A fairly recent discovery of mine on Jumeirah Beach Road, Shu offers the best spinach fatayer this side of the Gulf! What the restaurant lacks in its minimal interior decor, is clearly made up for in the kitchen. 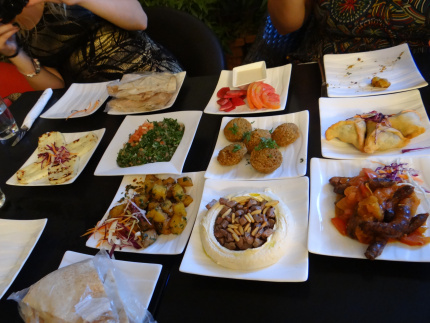 The food has to be the best Arabic food I have tasted in Dubai, across the wide range of mezze and the grilled meats. 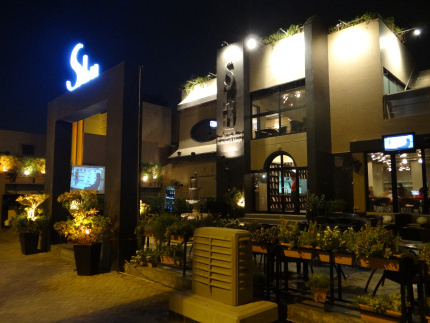 The shisha is equally as good and the prices are unbelievably low for food of such quality. I’m sure the people in Dubai who haven’t experienced and enjoyed Reem Al Bawadi are few and far between. 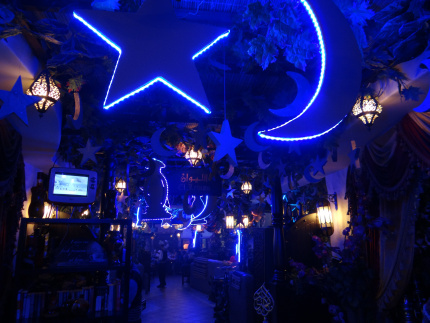 Another restaurant with consistently good food and warm and friendly (if a little frenetic) service, Reem Al Bawadi goes into overdrive for Ramadan – with moons and stars hung from every available surface. The only complaint here would be the size of the portions – during a time when we are supposed to be appreciating those less fortunate, it does seem a little hypocritical to be throwing food away.. 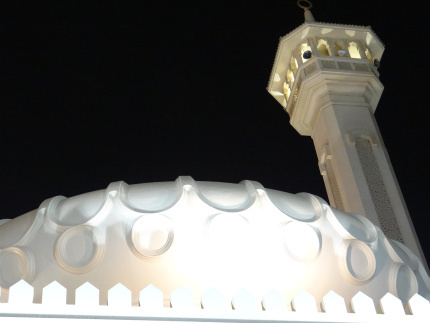 I am lucky to have some lovely Arabic friends here in Dubai, and have been honoured to have been invited to a several home iftars over the years. The type of food has varied with individual preferences and according to the host’s nationality (from Tunisia and Egypt, to Syria, Palestine and Lebanon) but what they all have in common is the festive atmosphere and outstanding hospitality. It’s something I can highly recommend to anyone – just remember to arrive on time (people don’t want to wait one more minute to break a 14 hour fast just because you weren’t organised!) and take something sweet with you to contribute to the meal.